Teaches you how to create a very popular effect on wood called "fish scaling". 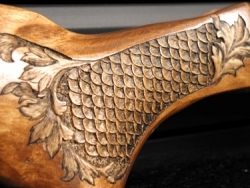 We will show you how simple it is to create the fish scale look on the grip of a gunstock. You will learn all the steps from laying the stencil, the engraving techniques, all the way to the finished work. We will teach you the tricks to create a beautiful gunstock.